My caption: Austin Curtis, 10 years old, Institute, West Virginia, October 10, 1921. Photo by Lewis Hine. 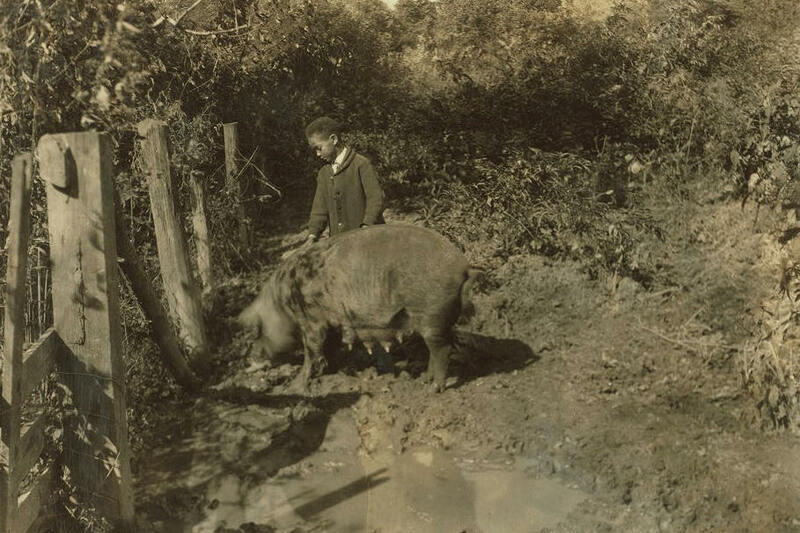 Lewis Hine caption: Austin Curtis and his pig project. He is a young colored boy living near the W. Va. Collegiate Institute, the State Colored Agri. College. Location: Charleston [vicinity], West Virginia, October 10, 1921. 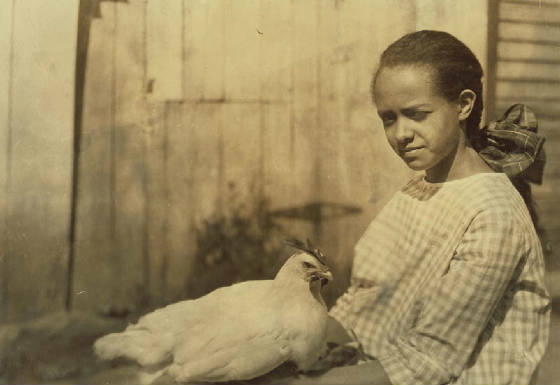 My caption: Alice Curtis, 13 years old, Institute, West Virginia, October 10, 1921. Photo by Lewis Hine. 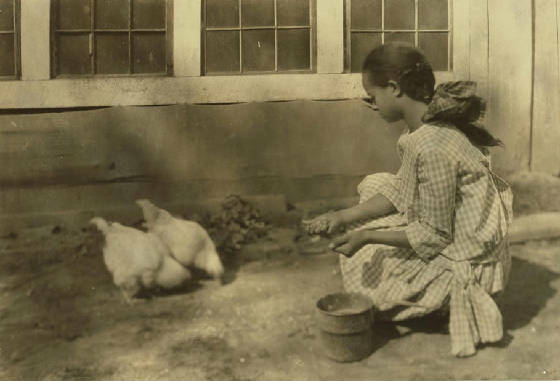 Lewis Hine caption: Alice Curtis and her poultry. Location: Charleston [vicinity], West Virginia, October 10, 1921. African Americans appear in only several dozen photographs that Lewis Hine took for the National Child Labor Committee. Obviously, this was the result of racial discrimination, but not on the part of Hine. Textile mills, factories, and canneries, where Hine took many of his pictures, were almost never integrated. Most mainstream newspapers catered principally to whites, seldom reporting news involving black residents, so almost all newsboys and newsgirls were white. Since there were not very many black-owned farms, most children employed as pickers were white. So Hine seldom encountered African Americans in the fields. As unfortunate as child labor was, it was not a “luxury” available to non-whites, especially among the occupations Hine concentrated on. In 1921, three years after the bulk of his child labor work was completed, Hine accepted an assignment from the National Child Labor Committee to photograph West Virginia school children, many that were involved in 4-H programs. Early that year, the state had enacted progressive laws limiting child labor and mandating school attendance. Hine’s pictures were supposed to illustrate how those laws were affecting the quality of life for children who might otherwise be typical child laborers. Institute, where Austin Curtis and his sister Alice were photographed, is a small town near Charleston, formed in the 1890s around West Virginia Colored Institute, a black agricultural college. In 1915, the name was changed to West Virginia Collegiate Institute. It is now called West Virginia State University, and was fully integrated in the 1950s, following the historic Brown V. Board of Education decision. Hine photographed one other African-American child in Institute, on the same day. His name was George Cox. In one of two pictures of him, he was getting guidance from Austin W. Curtis, the dean of the college, and the father of Austin and Alice Curtis. George’s story is also posted on this site. Hine could not have imagined the level of accomplishment that Austin and Alice were destined to achieve. Austin became an especially notable figure when he was hired as an assistant to George Washington Carver, the legendary botanist, educator and inventor, and one of the most celebrated African Americans of the 20th century. My caption: Austin Curtis, Institute, West Virginia, October 10, 1921. Photo by Lewis Hine. 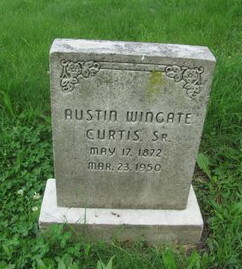 Austin Wingate Curtis Jr. was born in Institute on July 28, 1911, the son of Austin Wingate Curtis and Dora Thorne Brown Curtis. According to the West Virginia Division of Culture and History, his father was born in North Carolina in 1872. 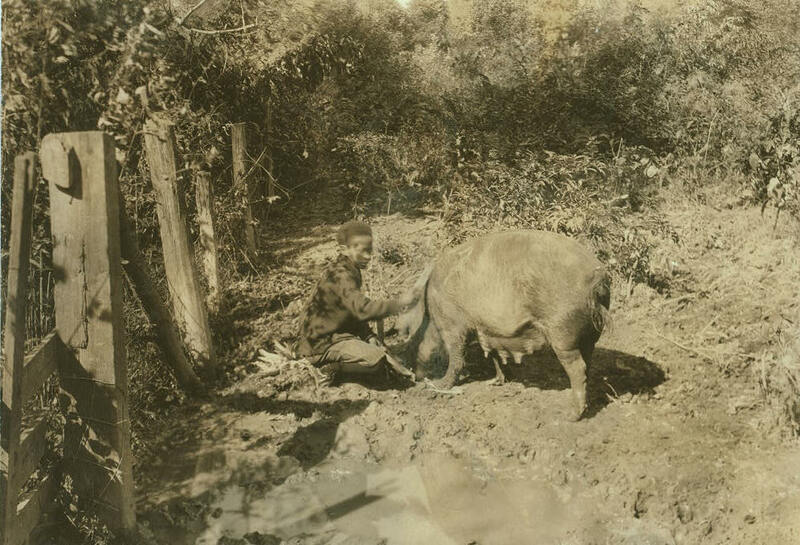 In 1899, he graduated from North Carolina Agricultural & Technical College with a master’s degree in agriculture, after which he was employed as a professor at the college in Institute, quickly becoming the head of their agriculture department. 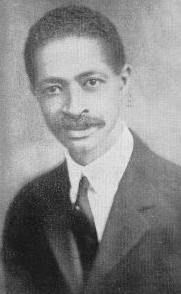 According to the Austin W. Curtis (Jr.) Collection at the Charles W. Wright Museum of African American History, in Detroit, Austin Jr. graduated from Cornell University with a PhD in chemistry. While he was teaching at North Carolina Agricultural & Technical College, he was hired as a laboratory assistant by George Washington Carver. When Carver died in 1943, Curtis helped to establish the George Washington Carver Research Foundation and the Carver Museum at Tuskegee Institute. He moved to Detroit in 1944 and established Curtis Laboratories, which created a variety of pharmaceuticals and cosmetics made from natural and organic sources. Austin Curtis married Oreta Adams, a Kansas native, whom he met when she was teaching at Tuskegee Institute. They had two daughters and a son. Oreta died in Detroit on April 8, 1991, at the age of 85. Austin died in Culver City, California, on November 5, 2004, at the age of 93. My caption: Alice Curtis, Institute, West Virginia, October 10, 1921. Photo by Lewis Hine. 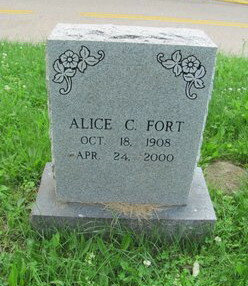 Austin’s sister Alice was born October 18, 1908. She graduated from West Virginia State College, and received a master’s degree at Cornell (where her brother received a PhD). She met her future husband, Marron W. Fort, when they were both teachers in Institute. Mr. Fort was the first African American to earn a PhD at Massachusetts Institute of Technology (1933). Their son, Marron Curtis Fort, graduated from Princeton and received a doctorate in German philosophy from the University of Pennsylvania. He currently lives in Germany. Alice Curtis Fort died in Washington, DC, on April 4, 2000, at the age of 92. Despite considerable efforts, I was unable to contact any of Austin’s or Alice’s children. I do not know if any of them have seen the Lewis Hine photographs. I contacted the archivist at the Austin W. Curtis Collection at the Charles W. Wright Museum in Detroit. He was unaware of the Hine photos, so I sent him a link to the photos on the Library of Congress website. He told me he would add them to the collection. Gravestones of Alice Curtis and her parents. At Cabell Cemetery, Institute, West Virginia. 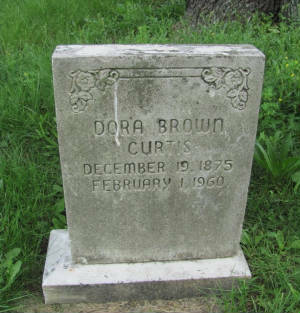 Courtesy of FindAGrave.com. Austin Jr. was apparently not buried in this cemetery. I could not find a picture of his gravestone.